Now that we had explored the facilities of the Pretty River Valley Country Inn it was early evening and time for dinner. I asked inn owner Linda Proudfoot for advice as to where to go. She suggested that we make the 10 minute drive to Collingwood, and go to Pine Street as there are several restaurants within a few minutes’ walk from one another. With almost 20,000 residents, Collingwood is one of the major towns in the Georgian Bay area. As the main town in the Blue Mountains region and the ski capital of Southern Ontario, it is also a regional centre of tourism. Historic Downtown Collingwood is an attractive heritage district with well-preserved Victorian-era architecture and many shops, boutiques and restaurants. 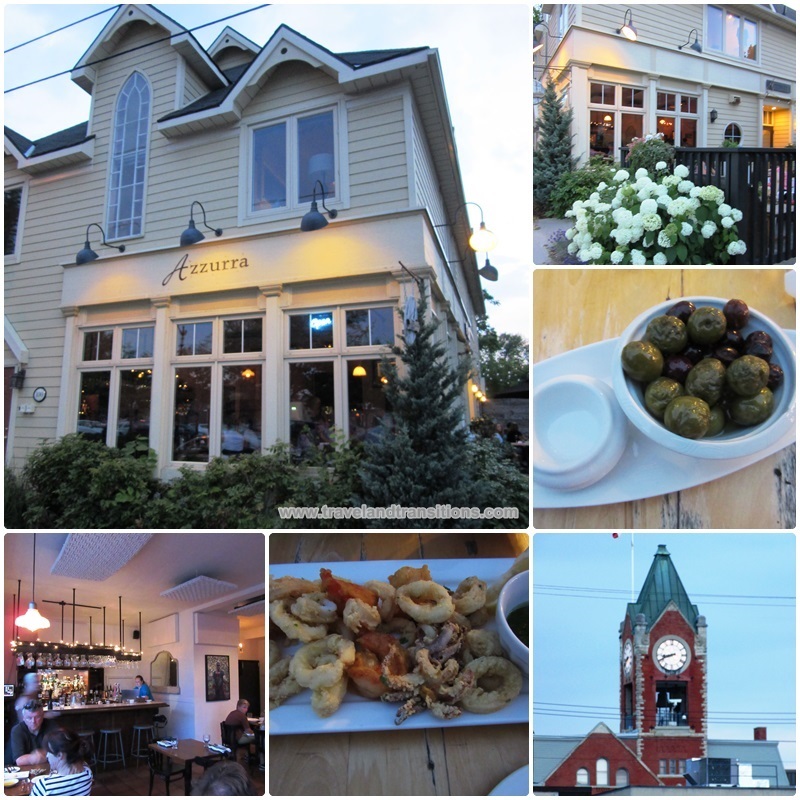 On Pine Street we had a choice to go for dinner at The Huron Club Restaurant & Bar, Azzurra Trattoria or the Admiral’s Post Pub. All three looked appealing and each of them has a nice outdoor patio to enjoy a nice summer evening. We decided to settle in at Azzurra Trattoria for dinner. 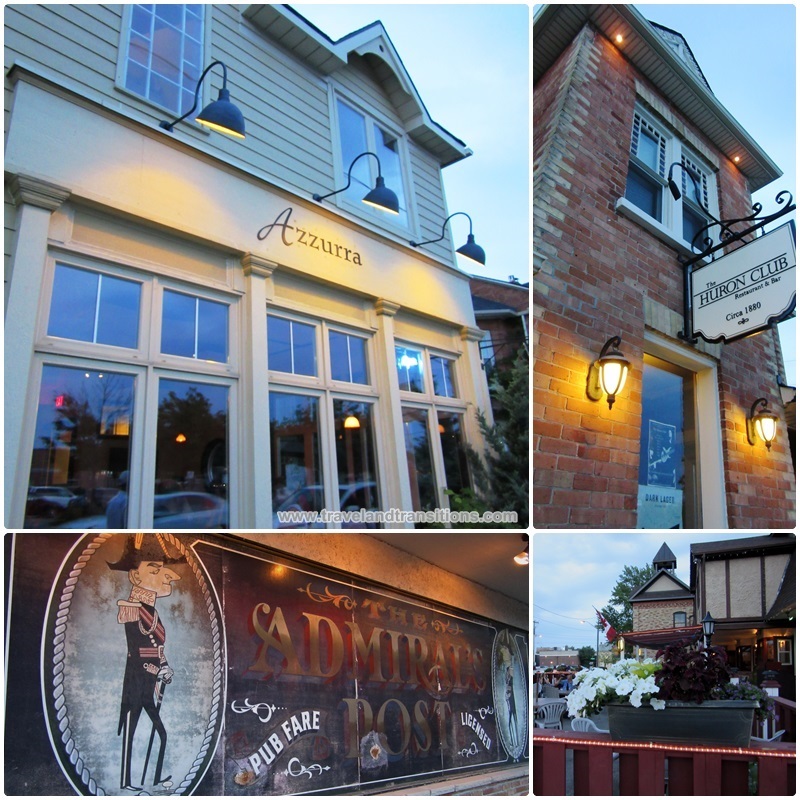 Azzurra is one of Collingwood’s most popular and top-rated restaurants. Run by chef Leona Nyman and Andrea Greyerbiehl, Azzurra is a trattoria with a casual, upmarket atmosphere. The specialty at Azzurra is the Pranzo, a long Italian dinner with several courses. On this warm summer night, we made ourselves comfortable on the attractive patio, and because we had had a very late lunch we were looking for smaller dishes. The perfect starter was warm olives that were spiced up with roasted garlic, orange zest and rosemary. We then followed up with a Fritto Misto of calamari and shrimps in crispy corn flour with chimichurri sauce and scrumptious Garlic Roasted Mushrooms. Our meal was a tasty conclusion of our second day in the Georgian Bay area. Our stay in Grey County was almost over, but we had truly enjoyed our country getaway and were already thinking about making plans to come back and explore more of this diverse travel region. After a good night’s sleep in the luxurious Ben Nevis Croft, we sat down for breakfast at the Pretty River Valley Country Inn on our last day in Grey County. 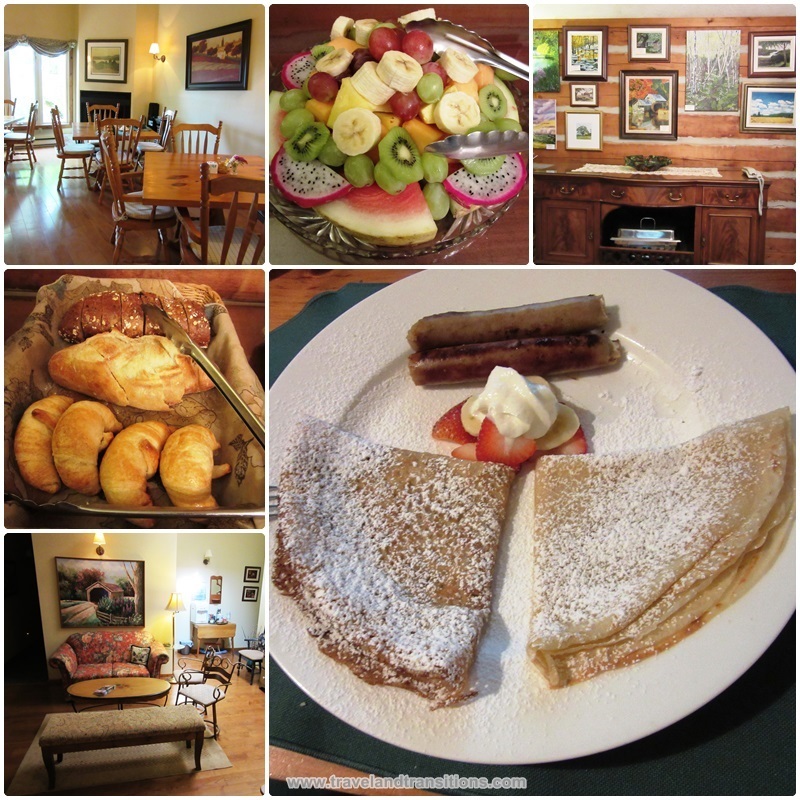 Innkeeper Paul Bilewicz was in the kitchen, preparing fresh crepes and an extensive breakfast buffet for the guests. Breakfasts at the inn include many food products that are produced right here on this organic farm, such as honey, freshly laid eggs, smoked bacon and homemade sausages made from the inn’s rare breed pigs. 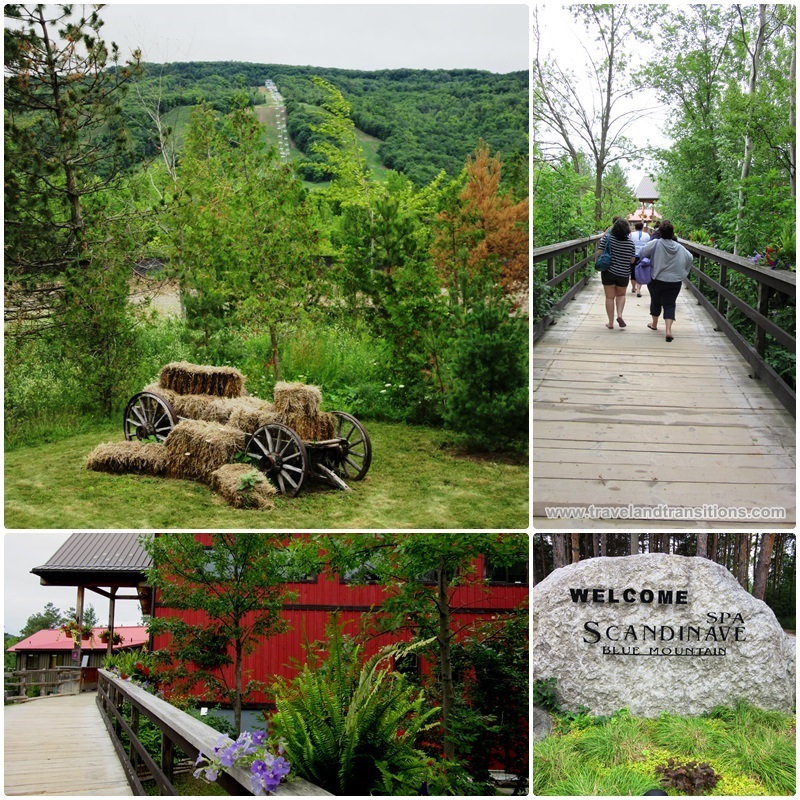 Inn co-owner Linda Proudfoot suggested one more stop for us before our drive back to Toronto: we definitely should drive into the town of Collingwood and visit the Scandinave Spa Blue Mountain, one of the most popular destinations in the region for a bit of pampering. It was not a long drive from the Pretty River Valley Country Inn into Collingwood, one of the main towns along the beautiful Georgian Bay. It took us about 15 minutes to arrive at the Scandinave Spa Blue Mountain, a spa complex that specializes in the Scandinavian Baths experience. The buildings are located on the west side of Collingwood, facing the Blue Mountain Ski Resort, one of Ontario’s largest ski resorts. We entered the 25 acre spa complex across a bridge which provides a great view of some of the 42 ski runs that are available at this ski resort. Birch, maple and pine trees surround the buildings, embedding them in a serene natural environment that is perfect for relaxation. Le Scandinave Spa Blue Mountain is part of a group of spas that also include locations at Whistler, Montreal and Mont-Tremblant. During my tour of the Scandinave Spa Blue Mountain I learned about the Scandinavian bath experience which includes a Finnish sauna, thermal & nordic Waterfalls, a Eucalyptus steam room, hot baths, cold plunges and relaxation areas inside and outside. Guests can relax among the trees on comfortable hammocks or sit and rest on Muskoka chairs, listening to the birds and enjoying the tranquil natural surroundings. Hydrotherapy uses the healing properties of water to revitalize and restore health by removing toxins from body tissues. The cycles of hot and cold water also help with decreasing inflammation. In addition to the outdoor pools, saunas and waterfalls, Scandinave Spa Blue Mountain also has attractive indoor facilities. Downstairs are spacious change rooms while upstairs is a café and a large sitting room with comfortable couches and a fireplace that overlooks the outdoor spa complex. 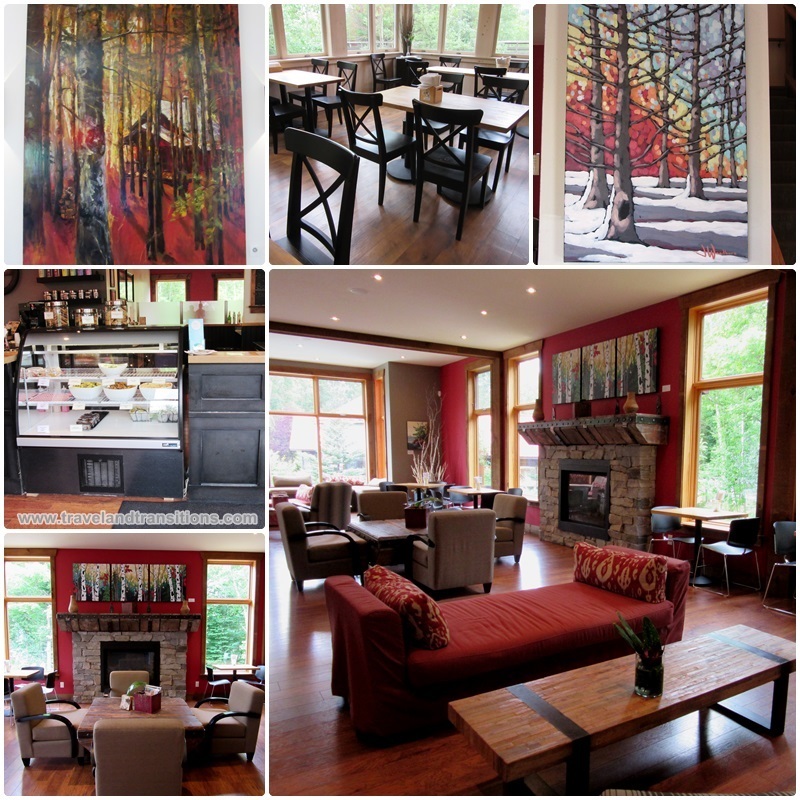 Original art by local painters adorns the crimson-red walls, and a café provides healthy food and snacks to spa visitors. A wide variety of massages are available at the Scandinave Spa Blue Mountain, including Swedish massages, Hot Stone and Sports massages as well as pregnancy massages and a 60- minute massage for two. 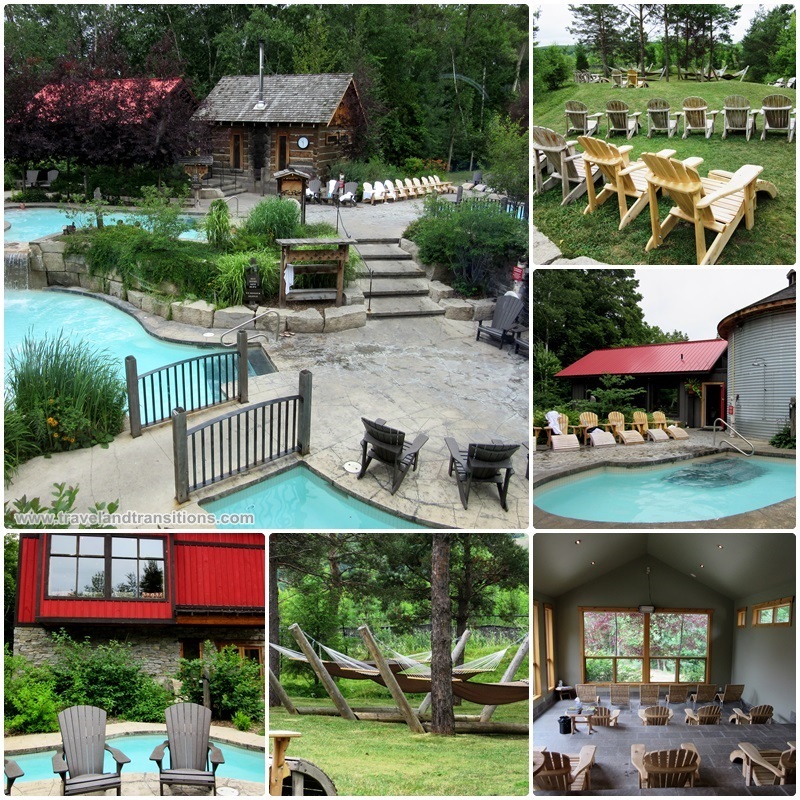 The Scandinave Spa is a popular summer and winter getaway for couples, moms and daughters and groups of girlfriends who like to get away for some healthy pampering. Our visit at the Scandinave Spa Blue Mountain concluded our excursion to the Georgian Bay area and despite the whirlwind of destinations we had visited we realized that there is so much more to see in this diverse and beautiful region, another reason to come back to explore more of what Grey County and the Georgian Bay region have to offer.